NORMAN, Okla. (June 9, 2014) – Phil Marks, of Dallas, Texas, and Tim Reneau, of Del Rio, Texas, brought 63.28 pounds of bass to the scales to win the two-day championship event of the Texas Team Trail presented by Cabela’s (TXTT) on June 8 at Toledo Bend. The winning anglers took home a brand new, fully rigged Ranger Z520C boat and Ranger Trail trailer powered by an Evinrude 225 hp outboard, valued at $66,000. On day one, the team fished isolated spots with jigs, bagging 24 pounds of fish by late morning. With a decent limit in the boat before noon the team headed 20 miles up the lake looking to upgrade a few of their fish. Going into day two with a six-pound lead, the anglers relied on the same tactics from the previous day’s action. Returning to their original spot from Saturday, the anglers quickly found themselves with 22 to 23 pounds of bass. Once the team culled to 25 pounds, they moved locations. Attributing their success to fishing one particular pattern, the anglers brought in a day two total of 32.10 pounds and won the tournament by a 19.30-pound margin. Having fished every one of the TXTT’s tournaments, Marks has been impressed with the Texas Team Trail so far. 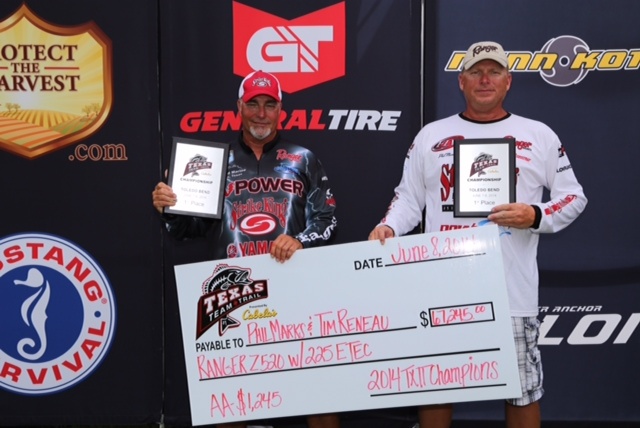 Second-place finishers Joe Setina, of Pittsburgh, Texas, and Lamont Loyd, of Gilmer, Texas, won a total of $46,162, including a boat upgrade from the Ranger Boat contingency program and $1,162 in Anglers Advantage cash. Lee Yowell, of Ennis, Texas, and Brian Schott, of Longview, Texas, took home $2,996 for their efforts. Their 9.7-pound bass won the Big Bass award and an extra $500. The team’s third-place finish catapulted them to the top of the Lucas Oil Team of the Year. The anglers narrowly won by one point in a close Team of the Year race and will receive Lucas Oil rings along with paid entry fees for the 2015 TXTT season. The championship wraps up another successful season for the TXTT. The 2015 tournament stops will include some of Texas’ legendary bass fisheries and feature high payouts with unprecedented contingency opportunities. For additional information, anglers are encouraged to call 210-788-4143 or check out the TXTT website at www.texasteamtrail.com. Site visitors can register for events, review the television schedule, get official Texas Team Trail gear, view results and learn more about what’s in store for 2014.